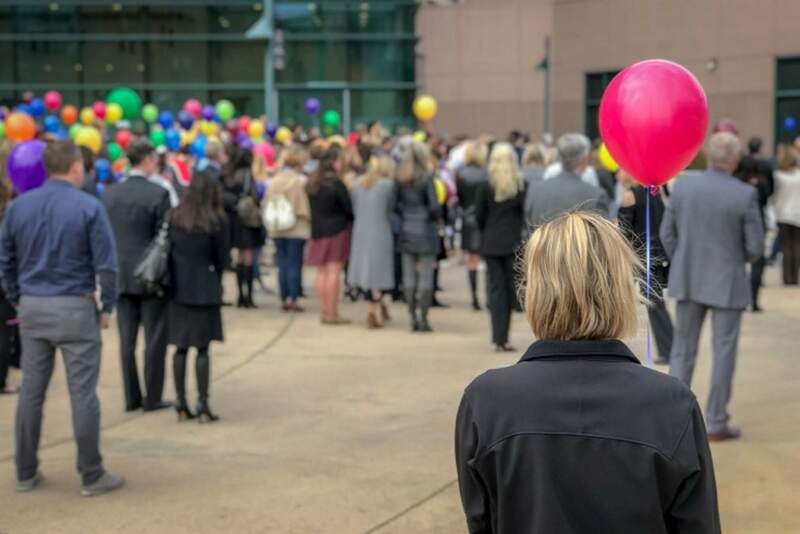 A woman waits to release a balloon Wednesday at a memorial service at Denver’s Pepsi Center for one of the Arapahoe High School students who recently died by suicide. A $2.8 million grant to help address teen mental health in Colorado is renewing attention among state officials on the subject of suicide. The announcement comes after two students at Arapahoe High School took their own lives. At a Wednesday memorial for one of the students at the Pepsi Center in Denver, friends and family members shared a common message of hope that this doesn’t happen again. The deceased teen’s father addressed the many students in the audience, pleading with them to reach out if they need help. “We cannot see your pain,” he told the hundreds gathered for the memorial. The community has struggled with a rash of recent student suicides, five in total over the last two years – four of whom went to Arapahoe. As teen suicide rates increase locally and nationally, many are desperate for answers. Mandy Conn, a parent of two Arapahoe students, said her daughter was especially reluctant to return to school. She’s a senior, the same year as the two students who died at the beginning of October. “She didn’t want to see empty desks in her classroom,” Conn said. Her kids weren’t close with the two students, but Conn said the community’s loss has everyone grieving and processing differently. She’s doing what she can to be there for her neighbors, her friends and her children, but she’s not really sure how to do that. “I wish I could say, ‘Oh yeah, I know how to deal with this now,’ but I really don’t,” Conn said. Her kids know what comes next, she said: The flowers in front of the school, the counselors in the classrooms and the tears in the hallways. There’s a routine for Arapahoe principal Natalie Pramenko as well. A 17-year school veteran, her experience has unfortunately prepared her for that call she made to the superintendent twice in recent weeks, and for what she had to say when she gathered the teachers. Parts of her response have evolved overtime, though. She now has a sophomore at the school, and that lens of being both a mother and a school leader has changed the way she communicates with the Arapahoe community. “I can also say, as a mom, would I want to know this? Do I need to know this? And often it’s yes,” Pramenko said. She now shares more information with students and parents. She sent out emails with suicide-prevention research, signs to be aware of, ways to talk to one another and resources to get help. Safe2Tell is one of those resources. The anonymous tip line has recently seen an increase in the number of reported suicide threats. To try and fight the trend, Pramenko said the community needs to rally around kids. “Getting in communication with doctors and clergy and youth groups, and just parents and teachers and mental health staff in the buildings,” Pramenko said. After last year’s student deaths, the Rev. Mark Feldmeir’s congregation at St. Andrew Methodist Church decided to bring suicide to the forefront by talking honestly and openly. The church held suicide-prevention workshops, and gave kids and families a place to be heard. “In the midst of all these stories of folks suffering from suicide, it opens up opportunities for us to talk about how we can build community and deeper connections of care and support and compassion,” Feldmeir said. He wrote a sermon to share what his congregation had learned: how despite the rise in social media, teens and adults feel lonelier than ever before. That risk factors for suicide include isolation, relationship loss and history of mistreatment. The lesson of his sermon is that each person in a community has responsibility for its well-being, which can be fostered through kindness and compassion. That compassion was seen at a recent soccer match. After the game, coach Brad Meyer said the opposing team met with the Arapahoe players and shared hugs and tears. “To have boys publicly having emotions and seeing that there’s other kids that have gone through whatever they’ve gone through, I felt moments like those are potentially very powerful things for kids,” he said. Meyer has worked at the school for 25 years, and grew up in the area. After the suicides, many friends and former students reached out with support and empathy. Some went to Arapahoe High during other tragedies, like the 2013 shooting that left two students dead, including the gunman. Events like these stick with people and communities, Meyers said. Arapahoe says they’ve seen an increase in the number of students coming forward with information about themselves and friends in recent years. They’ve also recently implemented a program, called Sources of Strength, to try and prevent suicides by connecting teens to peers and adults. These prevention efforts are trying to answer the question that seemed to be on everyone’s mind at the memorial service. What can we do to keep this from happening again?